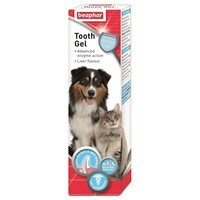 Beaphar Tooth Gel for Cats and Dogs 100g is a quick and easy way to ensure your pet has good oral hygiene, without the hassle of brushing their teeth. Containing Propolis, a natural anti-bacterial ingredient, this Tooth Gel helps to keep your pet’s teeth and gums in a clean and healthy condition. Easy to use, you just have to squeeze the gel along your pet’s teeth and let their tongue do the rest of the work. So for better oral health, use the Beaphar Tooth Gel! Very good product, definitely helps with plaque on my dogs teeth. She loves the taste too! This is great stuff. Our vet always compliments my poochs teeth, being 4 tears old and her teeth are in very good condition. We use this about 2-3 times weekly together with dentastics every other day as well.